← Chilli Festival at Victoriana Nursery Gardens. Well I did it!! All 26.2 miles of it. George was off camping with Scouts for the weekend, so Mark, Emily and I left home at 7pm on the saturday to drive to Southwark Park. The organisers had suggested that we park in the local shopping centre, which was free for up to 4 hours, so that was a bonus, and was only a 5 minute walk to the start line. The traffic was horrendous, and we finally parked at about 8.15pm. The whole park was buzzing with excitement. 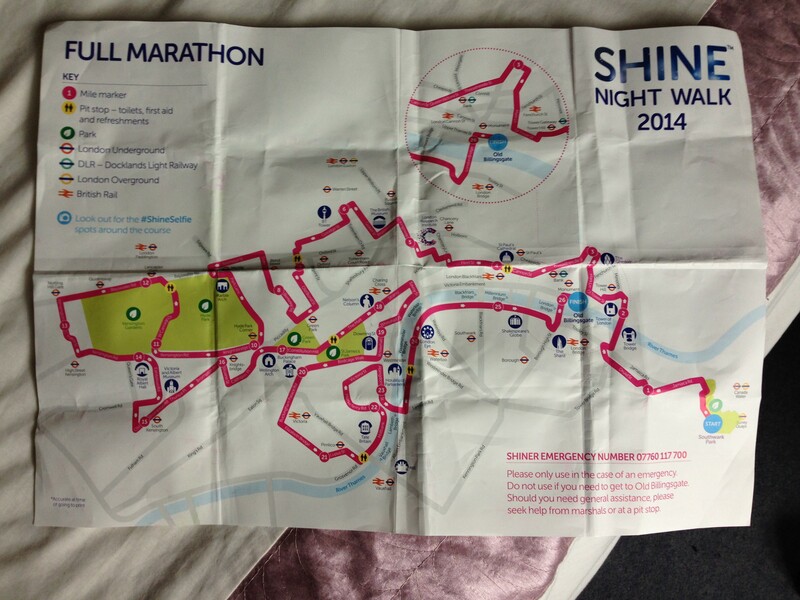 A load of half marathon Shine walkers had set off at 7.15pm, and we saw them as we drove past. But there were hundreds, if not thousands of people walking at the 9pm start, it was wonderful to see. There were 3 starting points “Power Walkers” who aimed to do it in under 6 hours, “Striders” who aimed to do it in 6-9 hours and “Strollers” who aimed to take 9-12 hours. 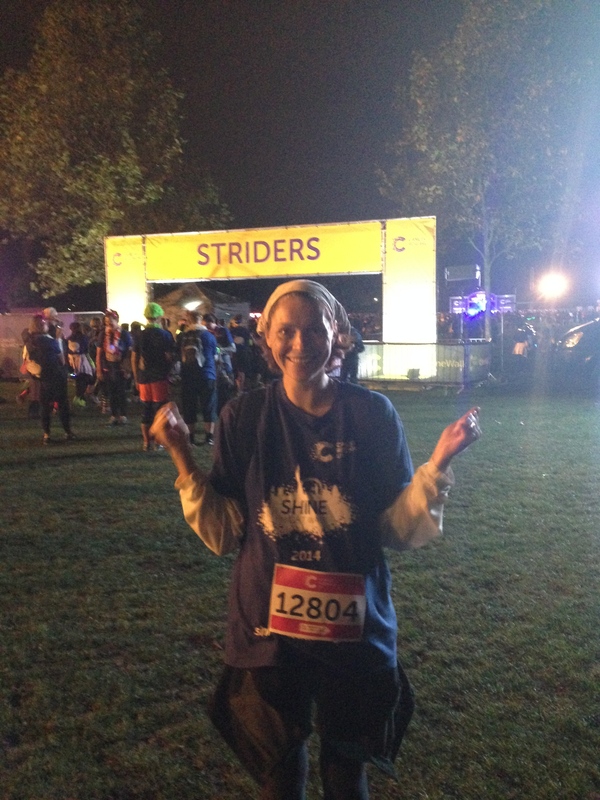 I went for the Striders, as when I did my test walk a couple of weeks before it took me exactly 7 hours. We all had wrist bands that glowed, which was very sensible because London can get very dark at night. Mark and Emily went to stand by the start line, and I was hoping to see them again at about 4am. The Power Walkers went first, and then all of us Striders then got going. 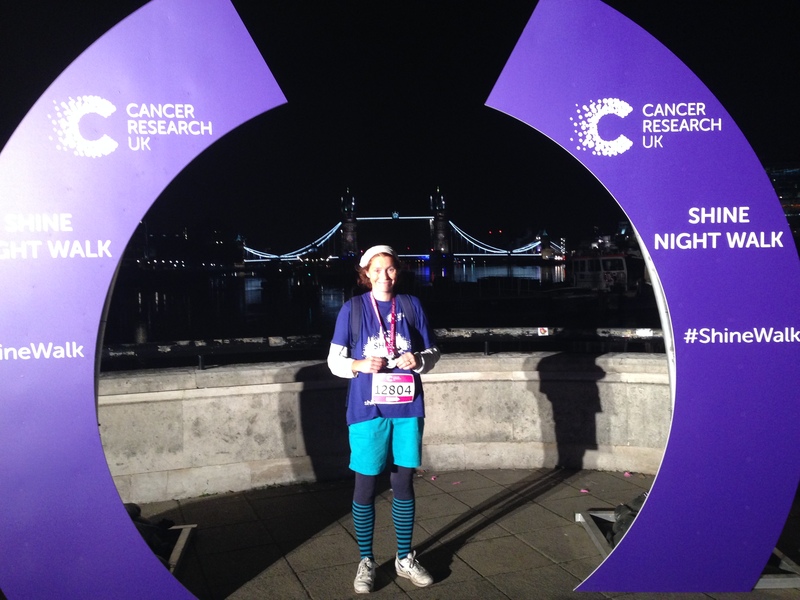 I went under the start line at exactly 9.10pm. I saw Mark and Emily, and gave them a wave, and set off into the darkness. The first couple of miles was a bit of a squash. And when you have long legs like I have and am used to walking a certain speed, this can be rather tricky. So I stayed on the outside, so I could overtake as often as I needed. I really should have gone with the Power Walkers, as I caught up with the slower ones after about a mile. I’ll know for next time. We had to stop to cross roads and I got a rather good view of the Shard it all it’s glory. It would be something that we would see a huge amount as we walked around. Sometimes it was very close, other times a really long way off. The Shard. Something I would be seeing a lot on my travels. 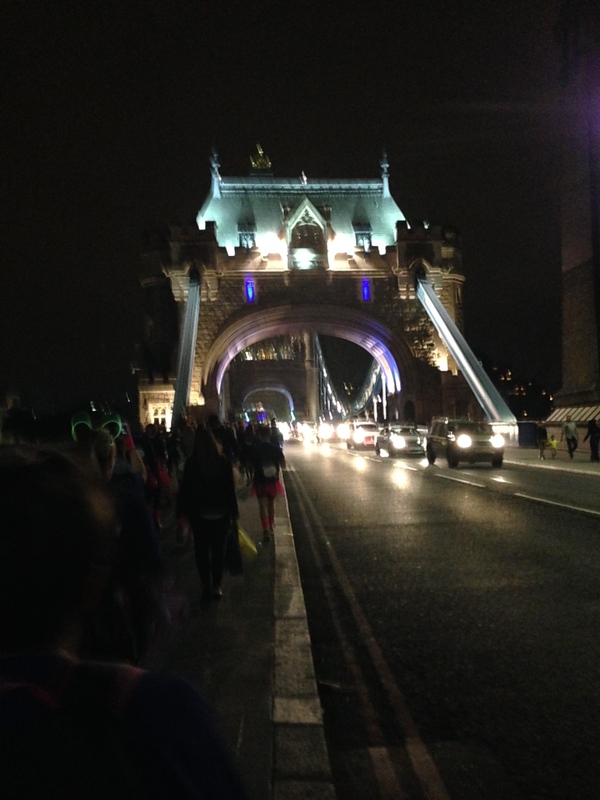 We crossed the Thames just before mile 2 and went over Tower Bridge and past the Tower of London. I couldn’t see the poppies as it was very dark. We wouldn’t see the Thames again until the very end. Tower Bridge at night. Fortunately it was down, so we didn’t have to jump. We passed many sights on our travels from The Gherkin, St Paul’s Cathedral, the British Museum and Marble Arch. This was all before we walked between Hyde Park and Kensington Park. By the time you had gone the first couple of miles, everyone started to spread out a bit, so it was easier to get a pace going that you were used to. By the time you reached the park at about 11 miles, we were all well and truly spread out. You would be following a small group that were just ahead, hoping that they knew where they were going, until you passed them, and then had to focus on another group. They had loads of helpers with glow sticks to show you the way, and there were arrows also helping you along. What also helped was, they had the miles up, so you knew how far you’d walked. This was great as when I was doing my training, I had to guess, and really had no idea how long I had left to go. 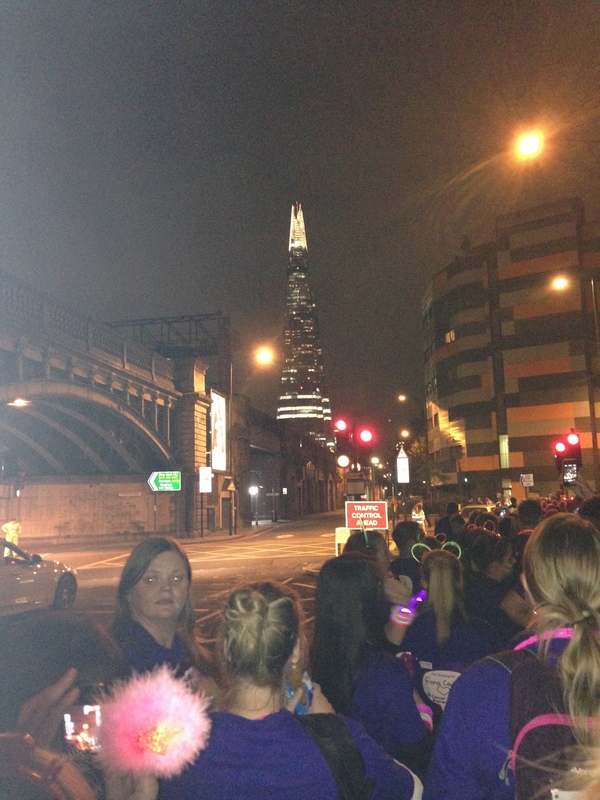 Seeing the miles go down was a great help, and the people with glow sticks was very encouraging when you walked past. They had about 6 pit stops, which had loos, first aid, water and snacks, and mid way between these stops, there were people with snack. This was brilliant. I’m glad to say that I didn’t use the portaloos, you know I have a thing about them. But sipped water often but sweated it out. Once we’d left the quiet of the parks we headed out down Kensington Road, passed the Royal Albert Hall, and into South Kensington. Loads of very posh people with chauffeurs wondering what all these smelly, sweaty people were doing. They tended to give us a very wide birth, I know I was most probably humming by that time. What also really made me smile, was that loads of people standing outside pubs would give you high fives. I apologised several times that my hands were very sweaty, but they didn’t seem to mind. I’m not sure if they were genuinely excited at what we were doing, or perhaps the alcohol helped. Either way it was a great boost. As we walked past Harrods, I decided that I’d better not go in (it wasn’t even open anyway). I didn’t think they’d have approved of me entering their store looking the way I did, and I had a back pack on and they don’t like those apparently. We then saw Nelson on top of his Column and not a pigeon in sight. Then we were supposed to go past Downing Street, but the road was closed, so we had to take a slight diversion. Then it was on to see the Queen at Buckingham Palace. She didn’t even wave from her balcony, I was very upset. Past Victoria coach station and people with suitcase clogging up the path and not having a clue where they were going. Past Tate Britain, and then just after 23 miles we crosed the Thames again. 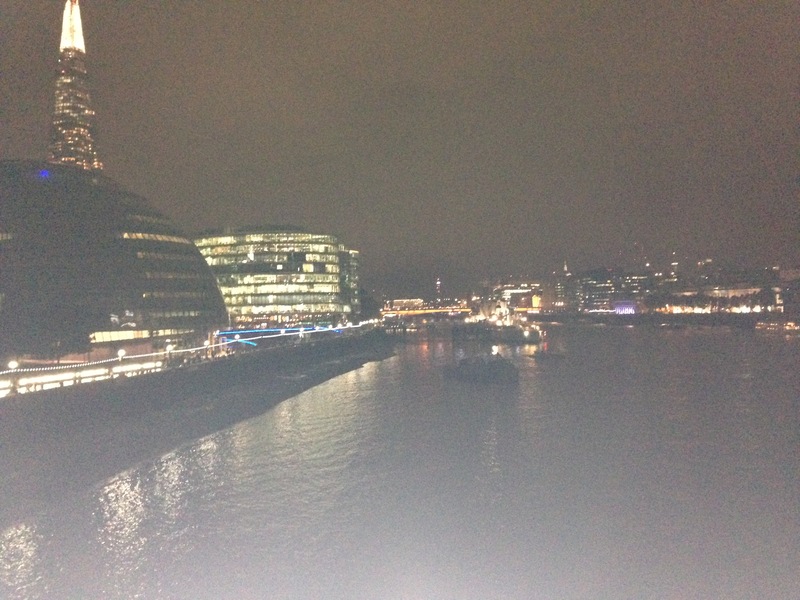 A view of the Thames at night. See the Shard in the top left. Gives you some idea of how far we walked. This was great news as I knew that I was nearly at the finish line. We then walked past the Houses of Parliament, but by this time I was getting very tired in more ways that one, so my tweets were getting quite sarcastic by this point. I believe I wrote “I’d like to see some of them do this walk. They could do with loosing a bit of weight”. Then past the London Eye (I’ve still never been on this) and along the Thames past the wibbly wobbly bridge or the Millennium Bridge to give it it’s official name. Past The Globe Theatre, and I said hello to Mr Shakespeare. Then finally over the Thames for the very last time at just before 26 miles, and then I needed to find the Monument. I was looking at my map at this point, and said “Where’s the Monument?” I looked up, and there it was right in front of me. It’s a huge thing, can’t be missed, except by me apparently!! Then the final push to the finish. Mark was there waiting for me (Emily was at home fast asleep), and we had to go up some stairs and inside a room to get to the finish line, where they had music playing and loads of lights shining, they made it really special. We had our photos taken and Mark took one of me. Please excuse the rather strange look on my face, I was rather emotional and rather tired at the time. I have no idea why. At the finish line. Can I go home now? I then asked Mark if he could carry me to the car, but he wouldn’t, to be honest I don’t blame him. When I got home I had a quick bath before going to bed. I woke later about 10am, had breakfast did some things (nothing too strenuous), and after lunch had another nap for a couple of hours. I was then asleep again by 10pm. I felt like a baby yesterday, sleep, wake, eat, burp and repeat. But no nappies or crying. In all the months I’ve been training I have only got one small blister, and that was on the side of my foot and on week 3 of training. When doing the walk I managed to get a blister under one of my toes!! How that happened I have no idea. I was a little stiff on Sunday, but today is Monday and I have no aches at all. Sorry about that. A massive thank you to everyone who sponsored me, I really appreciate it, and if you would still like to sponsor me you can, just click on my Just Giving Page and follow the instructions. Oh, and I know that you’re all dying to know how long it took me, well….6 hours and 57 minutes!! A new personal best. This entry was posted in Uncategorized and tagged British Museum, Buckingham Palace, Cancer Research, claire's allotment, Downing Street, Gherkin, Great fire of London, Harrods, Houses of Parliament, Hyde Park, Kensington Park, London Eye, Marble Arch, Millennium Bridge, Monument, Nelson's Column, Queen, River Thames, Royal Albert Hall, Shard, Shine Walk, Southwark Park, St Paul's Cathedral, Tate Britain, The Globe, Tower Bridge, Tower of London, William Shakespeare. Bookmark the permalink. Thank you. It’s a really long way, but seems further when you’re doing it at night. I think because you’re battling with being over tired as well. Well done Claire, what you need now is a relaxing day at the allotment. (I bet). Congratulations on doing the walk twice. I would like to do it again, but not for a couple of years though. Yes I was in Woman and Home in April or May I think it was. I get everywhere.